Those of you on Sprint, your time is coming. 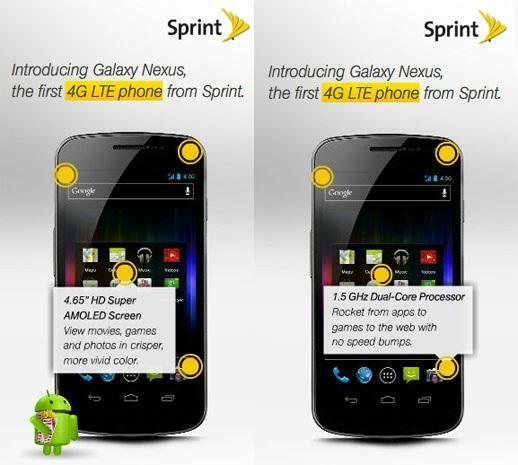 Sprint is expected to debut its LTE network in the first six months of 2012 and it looks like the Galaxy Nexus may be the first device to take advantage. Yesterday, The ad above appeared on CNET. It shows a 4G LTE version of the Galaxy Nexus with a 1.5GHz dual-core processor (faster than the Verizon and Unlocked models, which are 1.2GHz dual-core). Though carriers love to meddle with designs, it appears that the outward look of the phone, including the 4.65-inch Super AMOLED screen, has not been changed. Is this ad legitimate? We have no idea. Engadget claims that it was found on CNET and it looks correctly sized and designed to be a Sprint Web ad. Reportedly, it was also removed upon discovery. Sprint is not commenting. However, a Nexus product on Sprint isn’t an unheard of idea. Sprint was a proud supporter of the Nexus S, the last major Google phone, which launched a year ago. Much like with the Nexus S, unless Sprint speeds up deployment of its LTE network, the Galaxy Nexus may be six months old and well past its shelf life before it ever launches on the carrier. We look forward to CES, which should have a slew of LTE-related updates from Sprint and AT&T. Verizon is currently the only carrier with 4G LTE, but that will be changing soon. AT&T has already launched its LTE network in a few major cities and Sprint is working furiously to catch up. T-Mobile will be the wild card. The fourth-place carrier was hoping to be scooped up by AT&T this year, but it looks like that deal is dead in the water. Now, it will have to be dismantled or somehow build a 4G LTE network of its own or risk falling further behind than it already is thanks to AT&T’s incompetence. Luckily, a multi-billion dollar payout should be coming its way as severance from AT&T for the deal falling through. Is this true? We hope so. CES is only days away, so we should find out soon.